At the request of St. Martin’s Press, an ARC TPB was sent, at no cost to me, for my honest opinion. Synopsis (borrowed from B&N): All her life, Sara Gallagher has wondered about her birth parents. As an adopted child with two sisters who were born naturally to her parents, Sara did not have an ideal home life. The question of why she was given up for adoption has always haunted her. Finally, she is ready to take steps and to find closure. After months of research, Sara locates her birth mother — only to be met with horror and rejection. Then she discovers the devastating truth: Her mother was the only victim ever to escape a killer who has been hunting women every summer for decades. But Sara soon realizes the only thing worse than finding out about her father is him finding out about her. Never Knowing is a complex and compelling portrayal of one woman’s quest to understand herself, her origins, and her family. That is, if she can survive…. 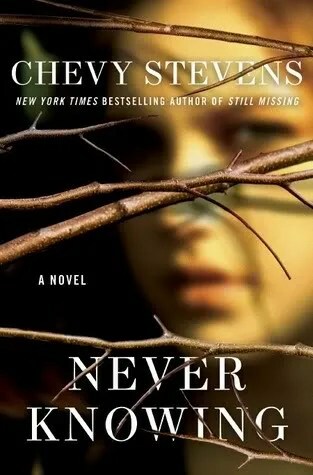 My Thoughts and Opinion: For those bloggers who were around, right around this time last year, you may remember there was a lot of buzz about debut author Chevy Stevens and her chilling novel Still Missing. A few months ago I was approached to read and review her newest book and since I was one of the bloggers blown away by her debut novel, I accepted. However, I tend to have a bit of apprehension when the first book is outstanding. Can the second book compare? Or was the author and first book a “one hit wonder”? My opinion…..Chevy Stevens is pure talent…..brilliant!!!! As in her first novel, the main character Sara, starts each chapter with a session with her psychiatrist but I found in this book that there was much more dialogue and interaction between the characters. Her writing style is fluid and so descriptive, which allowed me to visualize and create vivid imagery. I felt that I was easily transported into the story line. (Vague….due to not wanting to include spoilers) Example: when Sara’s cell phone kept ringing, I realized I was holding my breath waiting for her to answer the phone. Engrossing! A definite page turner! The characters came to life whereas even their emotions were felt. At times terrifying!! The ending, just when I thought it ended, another surprise!! Sara learns “be careful what you wish for”. Am hoping that this time next year, I will be reading her third novel!!! Chevy Stevens delivers again! !